Newsletter: Competing Goals: Pay Off Student Loans or Save for Retirement? : Competing Goals: Pay Off Student Loans or Save for Retirement? Competing Goals: Pay Off Student Loans or Save for Retirement? Many college graduates face a tough decision early in their working lives: pay off student loans or save for retirement. It’s a financial tug of war between digging out from debt today and saving for tomorrow, both of which are very important goals. As young adults adapt to living on their own, they must juggle their student loan payments along with other financial obligations such as rent, food, and transportation. Let’s face it, putting aside money now to use in four decades may not seem compelling when loans require immediate attention. The typical repayment term for student loans is a long 10 years. Waiting until loans are fully paid off before starting to save for retirement can mean missing out on years of potential tax-deferred growth in an employer-sponsored retirement plan or an IRA. If your employer offers a match, consider contributing the minimum amount to get the match, then try to increase your contribution amount as you can. What about paying more toward student loans each month to pay them off faster versus contributing those extra funds to retirement? 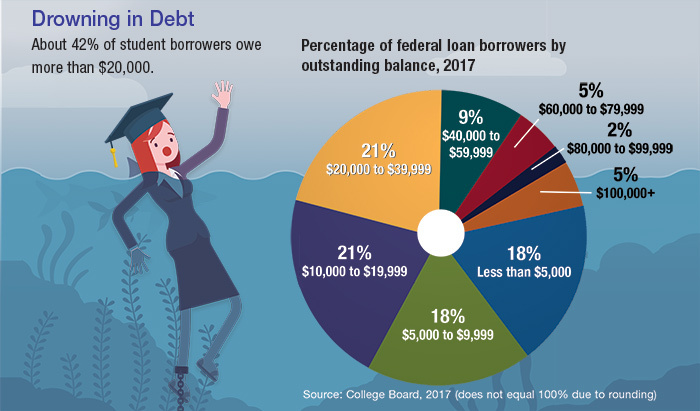 If the interest rate on a student loan is relatively low, the potential long-term return earned in a retirement account may outweigh the benefits of shaving a year or two off student loans. Realizing the dilemma that many young employees face, a handful of employers are offering student loan benefits, such as a specific amount toward student loan payments or an enhanced retirement plan match when employees contribute a designated percentage of their salaries toward repaying student loans.2 Watch for these benefits to grow in popularity as student debt impacts an increasing number of young workers. Schuler Financial Group and GWN Securities, Inc. are not affiliated companies.